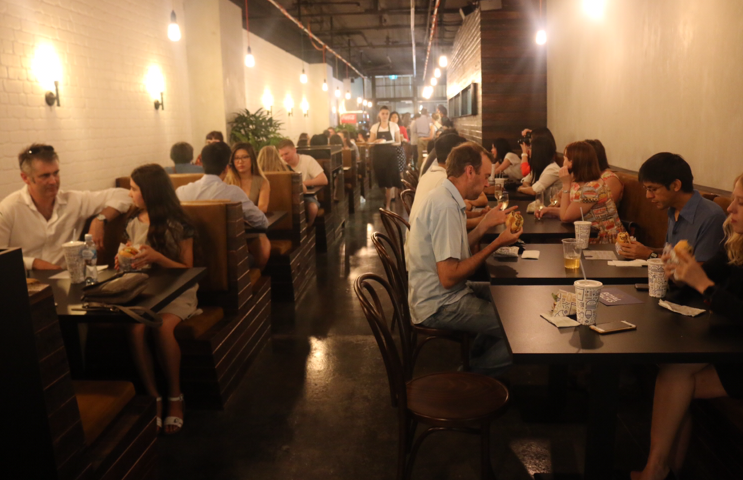 Changz canteen is an awesome place where you can catch up with friends for some burgers and bevvies. 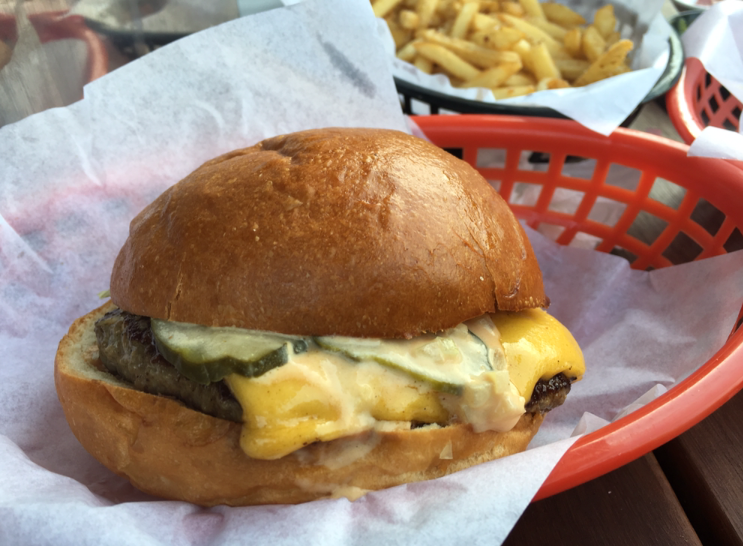 They are located in Elsternwick and do a mean cheesey. They do burgers but also have other tasty bits and pieces. And keep an eye out for their chilli sauces that are made in house. They are more tasty rather than burn your face off hot and are super delish. Changz has a laid-back atmosphere but the food is quality. My favourite kind of place. 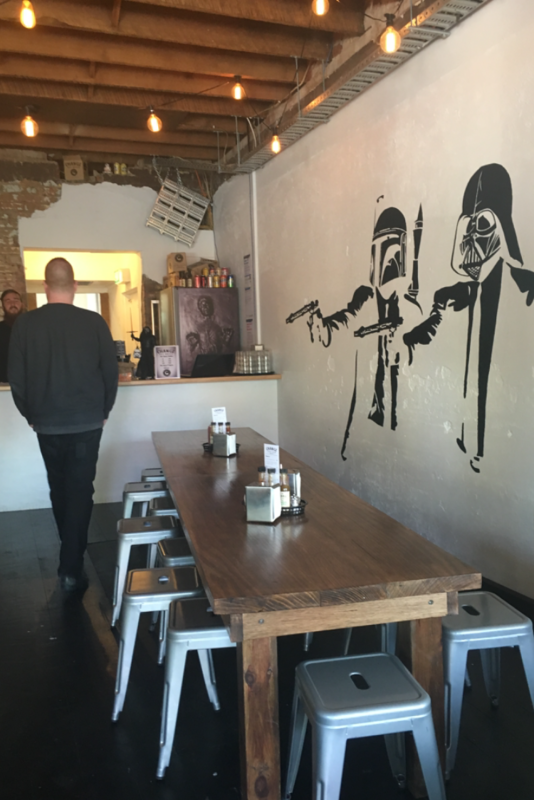 It’s a casual dining space with a relaxed vibe and some cool stencils on the wall. They have share tables for larger groups and outdoor seating out front for good weather days. The standard cheesey was delish. The beef was juicy, the pickles were sliced super thin, the cheddar cheese was melting, the onion was finely diced and Changz sauce brought it all together which was like a red chilli mayo (not hot). 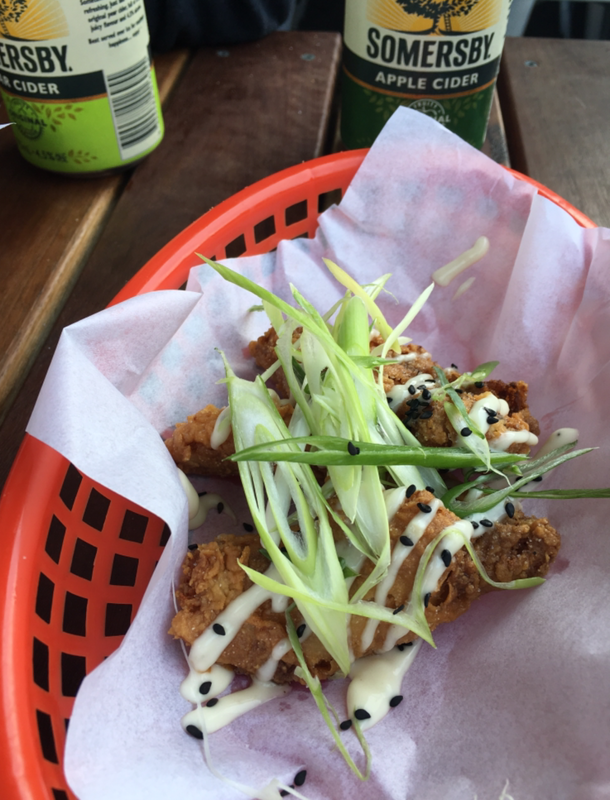 The chicken ribs were deep-fried, delicious and crunchy and were served with aioli, sesame seeds and spring onions. The chicken was moist and tender. They come in a serve of three or nine. I got three on this occasion but I could have easily devoured nine. Loved them. The spicy fries were great. Firstly I love shoestring chips so that was an easy win but then they were coated in a delicious chilli salt which made them even better. 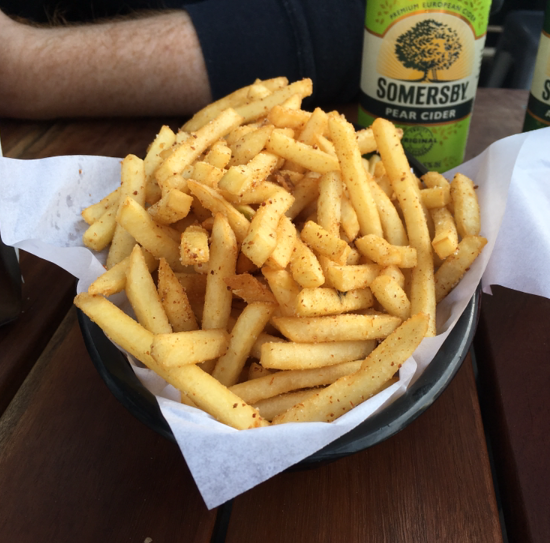 The chilli salt is made out of their house made red habanero sauce, which explains why they’re so tasty. 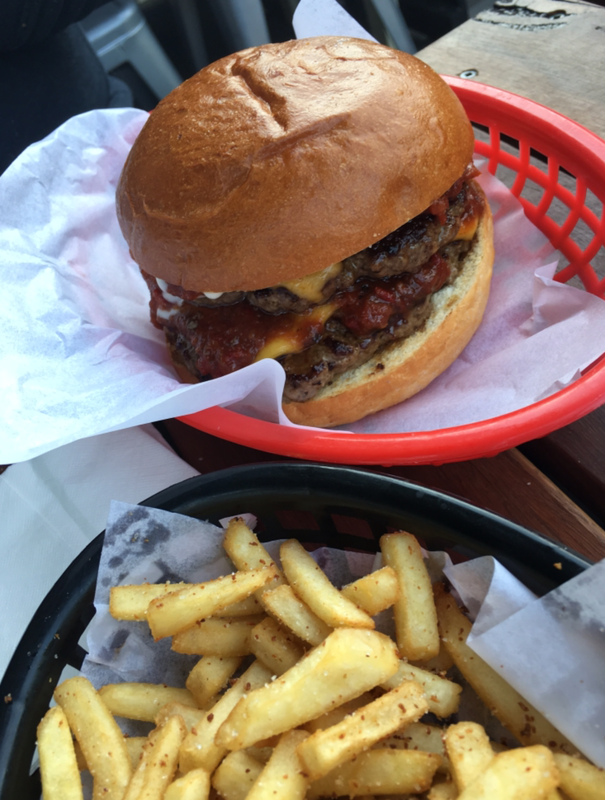 We also had the double chilli cheeseburger, which was good too. It’s the kind of place that lets you create your own monster of a burger so if you like to customize you can. Extra bacon, additional patties, chicken bricks, jalepenos etc. Also they have some beverages available. An apple Somersby cider with my burger, yes please. The staff were lovely and the food was awesome. Gotta love a good cheesey. 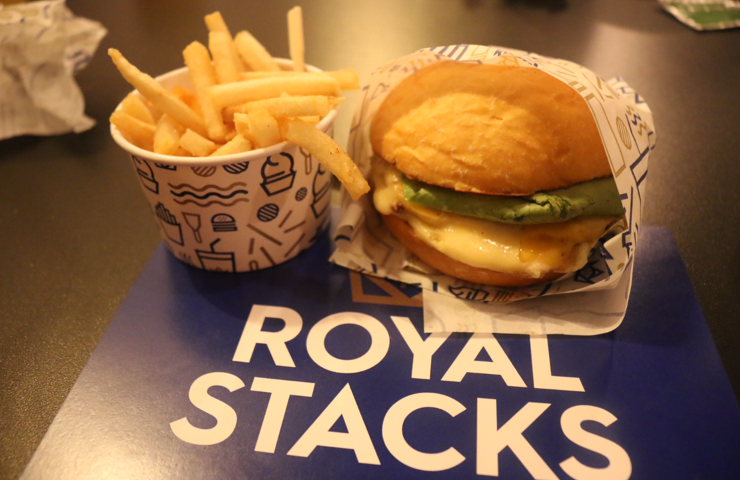 Royal stacks is a new burger joint in town that opened today. 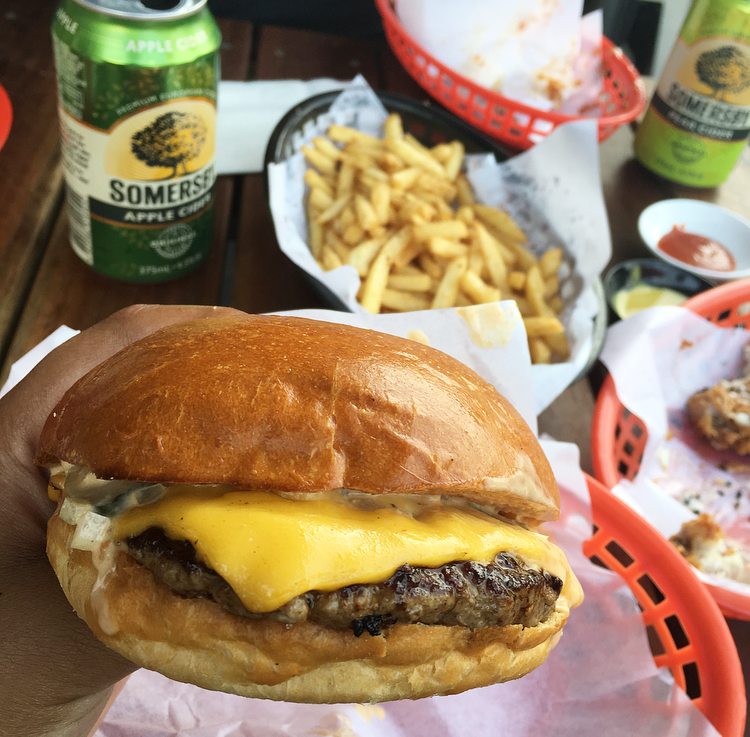 If anyone in Melbourne is an expert on creating a burger it’s Dani Zeini, who has proven his burgery genius through restaurants like Dandenong Pavillion, Grand Trailer Park Taverna, Truck Stop Deluxe and Easey’s. The beef in all the burgers is sourced locally and the patties are minced fresh daily. Even the buns are baked fresh with no preservatives added. These little details are what make these burgers so tasty. 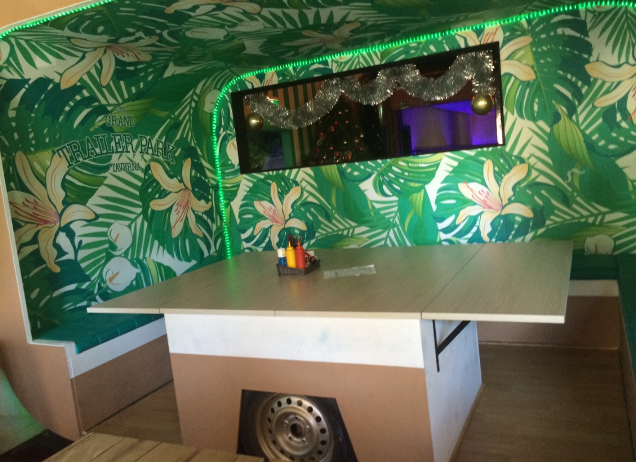 Inside it has an American diner style atmosphere. When you’re trying a new burger place for the first time, I feel the classic single stack gives you a good indication of the quality of burger you’re dealing with. This one had an all Australian beef patty, tomato, butter lettuce, American cheddar, special burger sauce and pickles. 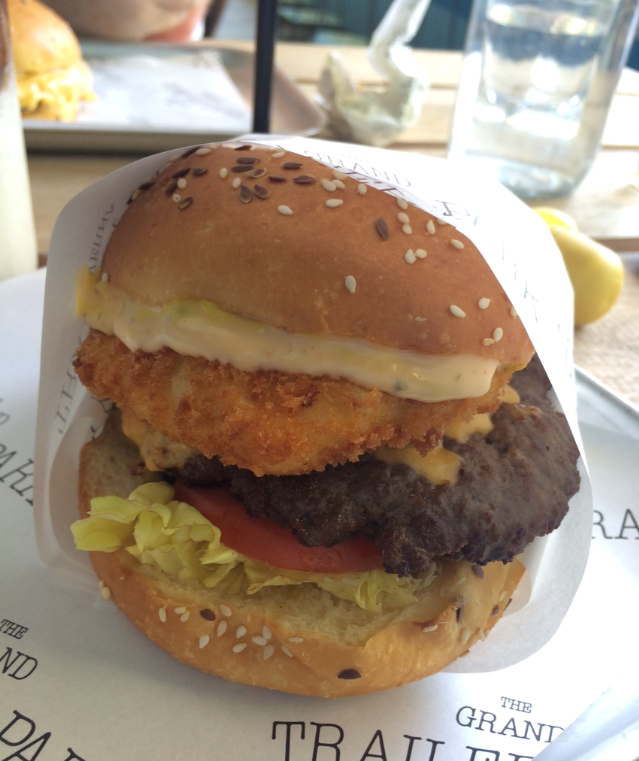 The meat was juicy, the salad was fresh, the bun was soft the special sauce went well and the cheese oh the cheese. It was delicious. The bacon bacon was mammoth, it was one gigantic burger with double beef patties, double bacon, American cheddar, caramalised onions, American mustard, tomato sauce and pickles. This one is not for the faint hearted. Miss Elizabeth is elegant and gets right down to business, no unnecessary vegies allowed. It’s a beef patty with swiss cheese and truffle mayo. A little bit fancy and a whole lot of delicious. Prince Harry has a beef patty, butter lettuce, American cheddar, swiss cheese and this amazing horseradish, shallot & gherkin mayo sauce. Yumm! The Saint burger is the spicy one. It has a spicy chipotle mayo and jalepenos. So it’s definitely for those who like it hot. 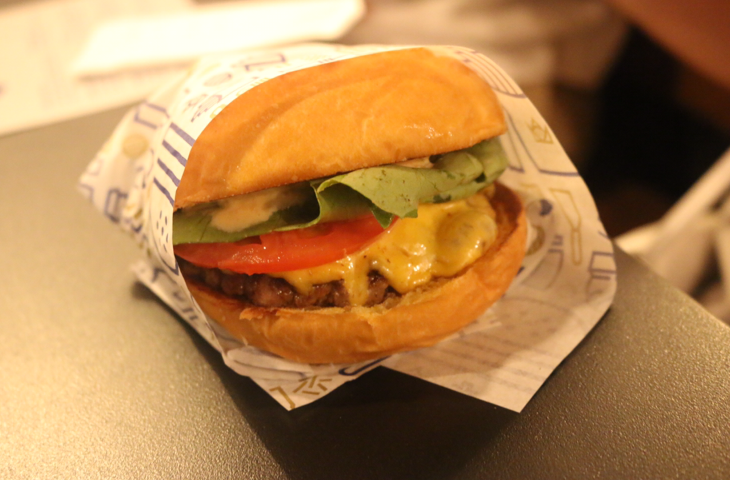 They also have the Queen Bee, which has a chickpea patty so vegetarians can enjoy a tasty burger too. And for sides they have shoestring fries and potato gems. For dessert 7 apples make a frozen custard which was similar to gelato but a little bit sweeter. The chocolate and vanilla were my fave. 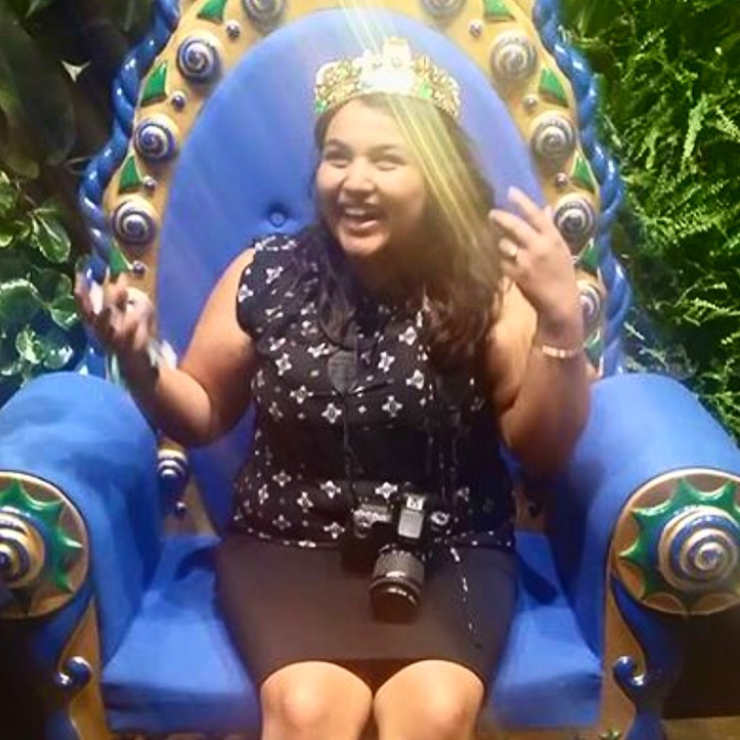 As you walk in there is a royal blue throne with a royal stacks crown. And so naturally…this happened. 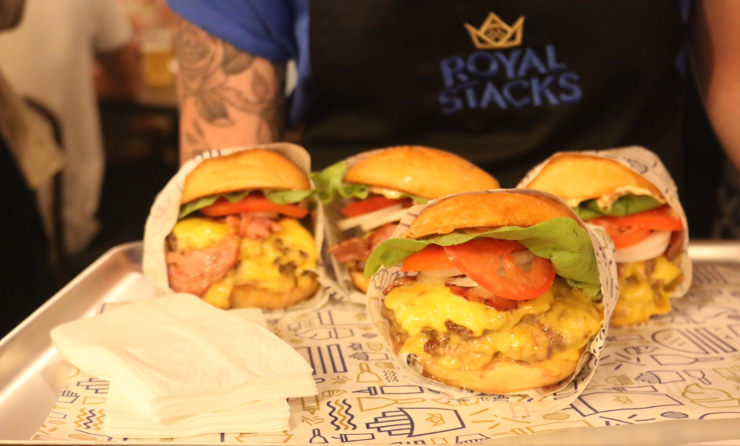 Royal stacks is now open so you can pop by on your lunch break, after work or on the weekend for some tasty burgers and beverages in the city. 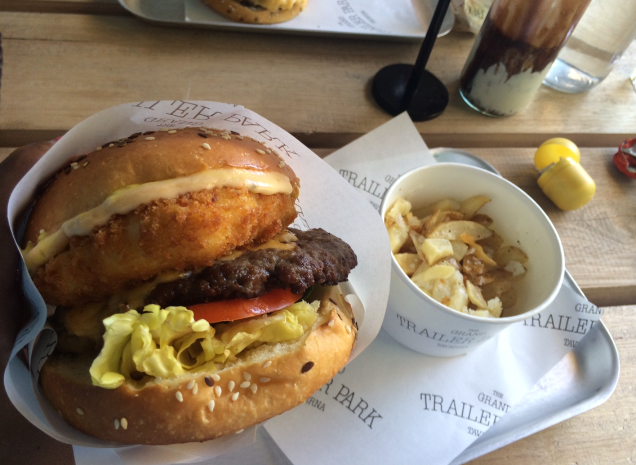 Grand Trailer Park Taverna is a spin off from the ‘Dandenong Pavillion’ restaurant with a focus on their renowned beef burger. 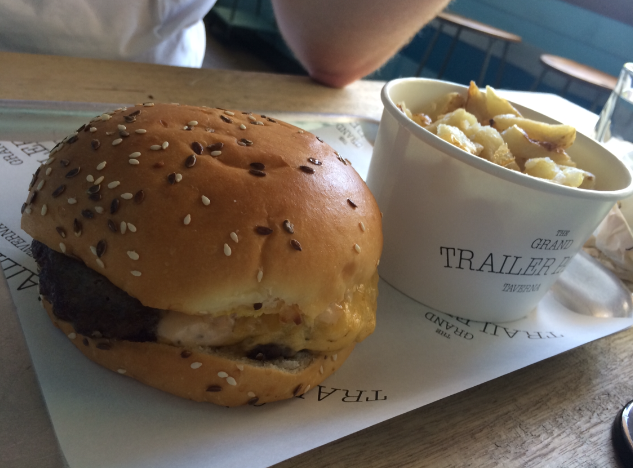 It recently opened in the city and the burgers are mouth-wateringly (is that a word?) delicious. The venue is a large open space with lots of park benches and open caravan booths (all indoor). Cute setup. There are crumpled paper menus scattered across the bar (trailer park style). You order at the bar, take a number and find somewhere to sit. We sat outside in the sunshine with the beautiful city view. We got the KSA burger (the dpavillon celebrity burger), which has a premium Aussie beef patty, cheddar cheese, tomato, butter lettuce, special burger sauce & American mustard on a toasted brioche bun. The actual burger (like the meat patty) is a real star. It’s grilled and juicy, just overall really tasty. 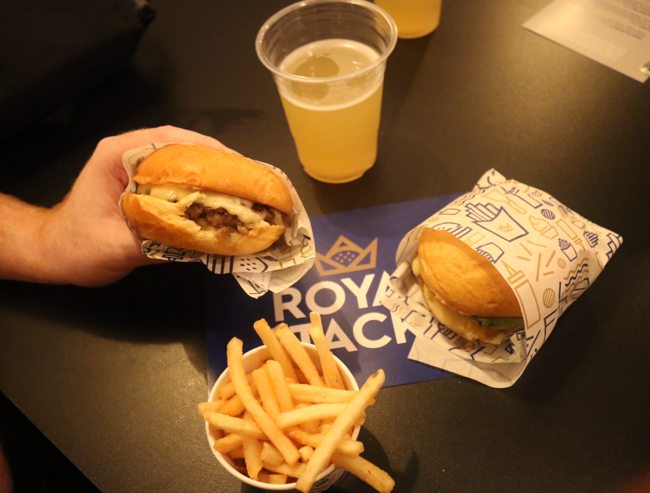 We also got the Francis Underwood burger, which is basically the same as the classic KSA burger but with a bonus mac and cheese croquette sandwiched in. Yum! The toasty brioche bun was buttery and had sesame seeds sprinkled on top, delish. The meat was juicy, the cheese was melty and the lettuce and tomato were fresh. The mac and cheese just made it that extra bit more indulgent and the sauces brought it all together. It was fantastic. They also have a mushroom burger if you don’t feel like meat. And if you don’t feel like bread, you can order a no carb protein style burger, where they give you a lettuce bun in place of the bread (saw pics on instagram) and also you could probs request to have mac and cheese croquettes in place of the bun (also seen on instagram). Hmm not for me though, I like buttery buns and I cannot lie, these other burgers can’t deny. Hehe. Next time I’ll be getting the Atomic burger. It sounds amazing. It’s a beef pattie, cheddar cheese, chilli cheese kransky, crispy bacon, BBQ sauce and truffle cayenne mayo on brioche. Yum! All the burgers sound amazing! The hand-cut chips are delicious. They’re more soft than crunchy, sort of like roasted potatoes hand cut into chips and then sprinkled with sea salt flakes. Yum! They have four awesome spiked milkshakes. We got the Kinder Surprise shake, and oh my it was so good. It was spiked with Frangelico and Baileys and it was super delicious. Definitely up there in my list of top milkshakes. 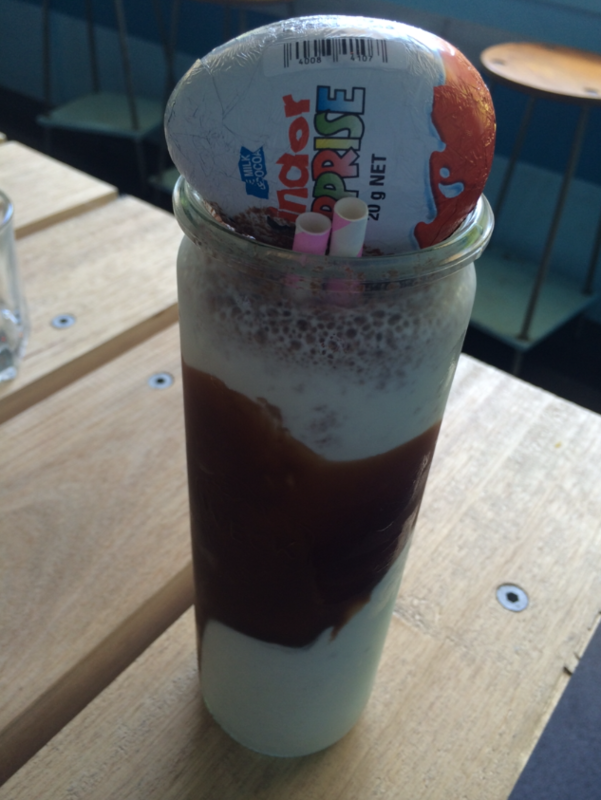 It had an actual kinder surprise on top (yay) and the milkshake was amazing. They also do a Maker’s Mark bourbon, salted caramel, maple bacon shake, a marshmallow, blue-haven, vanilla vodka shake and a peanut butter and jelly shake with Captain Morgan’s Rum. Yum, yum and yum! On the menu there is a range of desserts that I wanted to try (bananrama, wizz fizz ice-cream etc) but that double carb burger really stole all of my stomach space. I saw the chocolate waffle stack get placed on the table next to us. It looked so good. It was like a dessert burger. It was Nutella parfait, fresh cream and strawberries sandwiched between two house-made waffles drizzled with Nutella sauce. You can also get the waffle stack with peanut butter parfait and caramel sauce. Yum! Maybe next time. 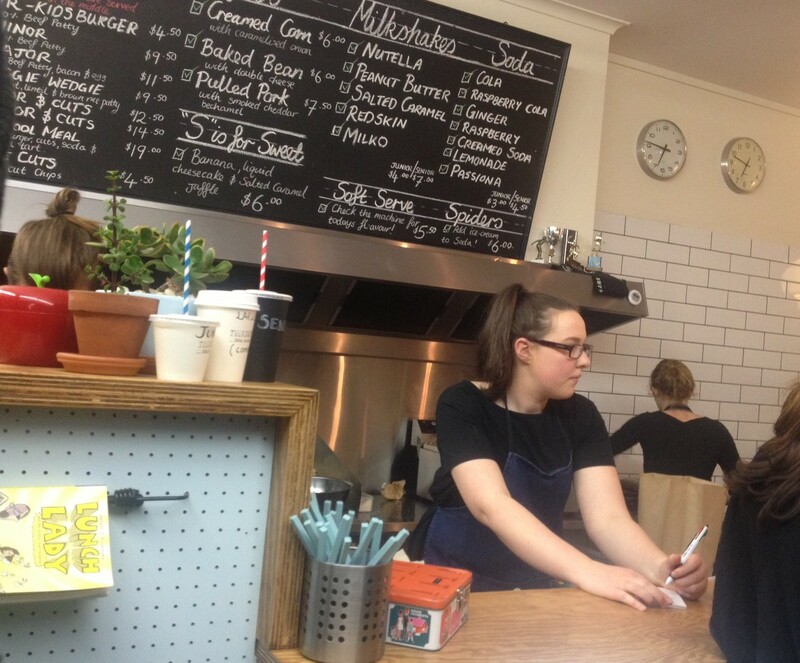 The décor is cute, the staff is really nice and the burgers are great. 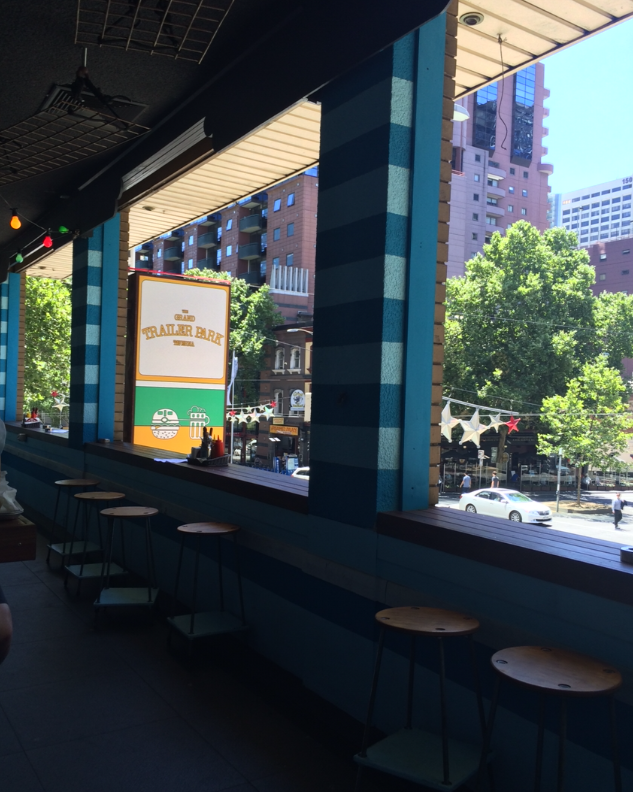 A perfect place to hang out with your mates for a burger and some bevvies. I heart Grand Trailer Park Taverna! I love zombies, that is, until they emerge from the ground in real life and try to eat my brains. But no I feel for them, they are just dead hungry and are doing what they have to, to satisfy their innate hunger for ‘brains’. After a week of trying to diet by excluding carbs entirely, I adopted similar characteristics that of a zombie. I was weak, miserable and walked around lifeless muttering “Mrgh Grains”. I completely understand the distraught desperation for food. But then who doesn’t love zombies and who doesn’t love grains burgers? Put these two things together and out pops a great restaurant. Zombie Burger – Zombie Wall. Zombie burger is a zombie themed burger joint that opened a few weeks ago. They support local produce and source their ingredients from Australian farmers. In celebration of Melbourne’s first ZomCon (zombie convention) held today, the recent announcement of Marvel and George A. Romero (dawn of the dead) teaming up to make a new comic ‘Empire of the dead,’ and season 4 of The Walking Dead starting next week, I thought it apt to blog about Zombie Burger. 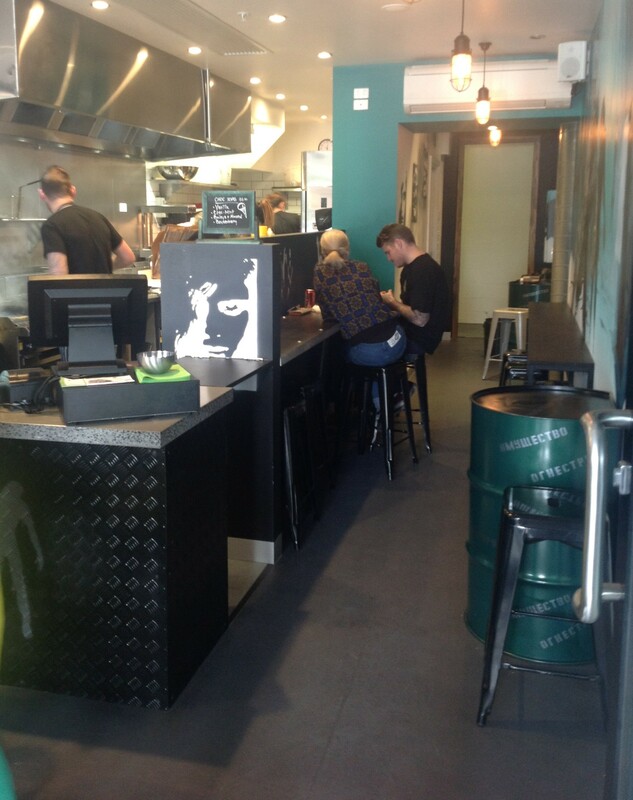 Zombie Burger – Street View. 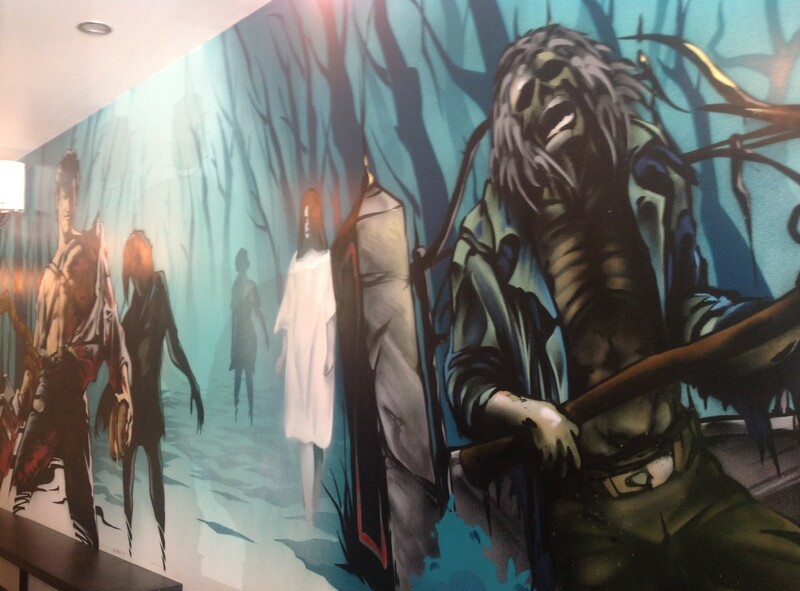 It’s a little place off Ackland Street with zombies hand painted on the walls. 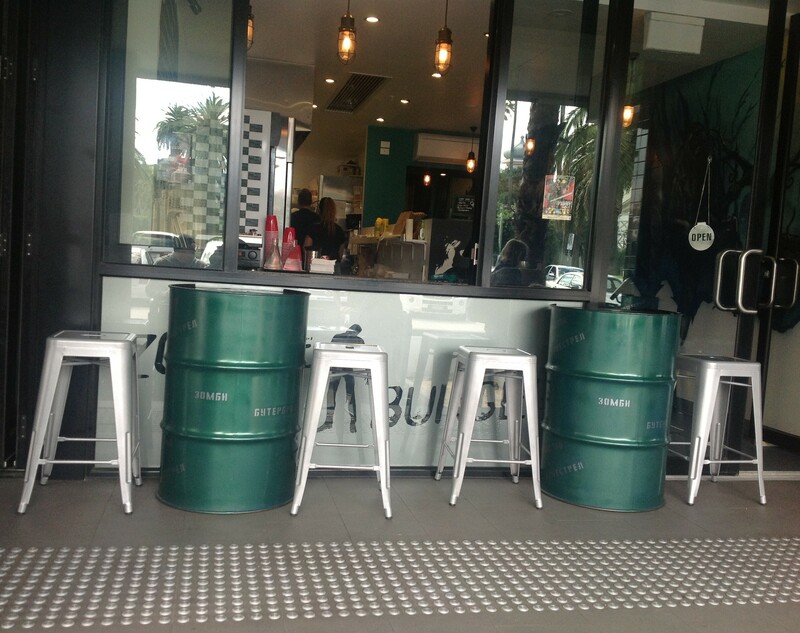 The tables are dark green metal barrels, the kind of barrel you shoot in a video game and it blows up, leading multiple zombies to their demise. It gave the place a cool military feel, sticking to the zombie theme. The rubbish bin had hand prints of blood smeared down the side, which I hoped was part of the atmosphere and not an indication of a recent brawl the night before (relax it wasn’t real blood). 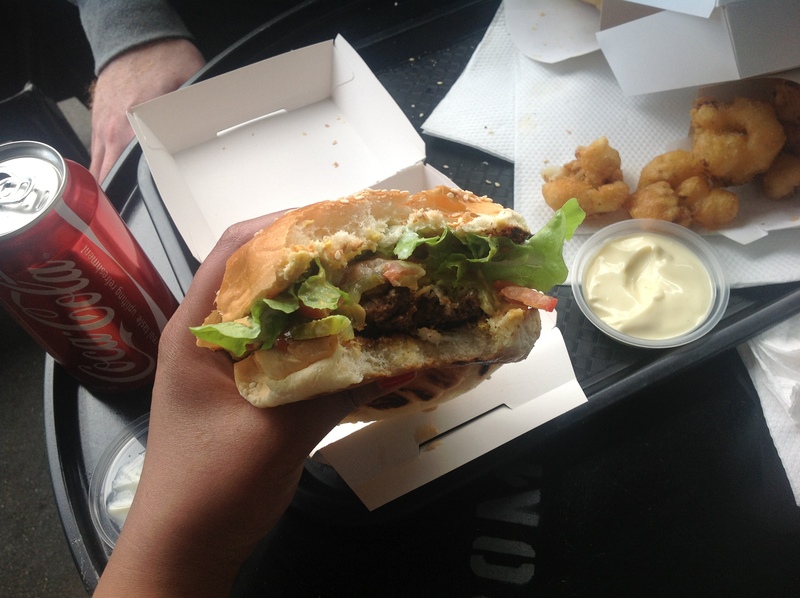 Zombie Burger – Zombie Burger. The burgers were delicious. I got the Zombie Burger. The brioche bun seems to be all the rage with burgers these days and it makes sense, it definitely works. The sweetness of the toasted brioche compliments the fire-grilled grass-fed beef. 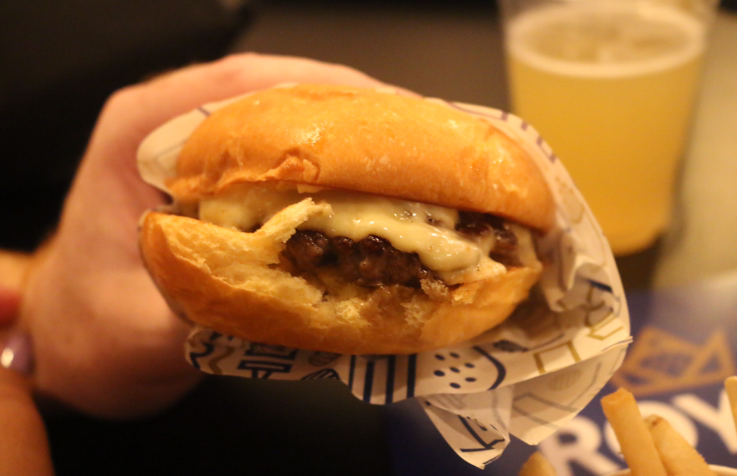 The beer caramelized onions were to DIE for (super sweet, really tasty and melt in your mouth). Then there was American cheese, dill pickle, vine-ripened tomatoes, oakleaf lettuce with American mustard, ZB ketchup, and ZB signature mayo. It was a little messy, but delicious none the less. Zombie Burger – Potato chips and cauliflower fritts. The crunchy golden deep fried cauliflower fritts were yummy. They were an awesome substitute for fries and they sort of look like brains. The fries are good too. I got the garlic aioli to dip them in, which was super creamy but overly salty. They have some really delicious vegie options too. ‘Shroom of the dead’ is basically the zombie burger (without the beef of course) instead featuring a porcini-infused whole fire-grilled Portobello mushroom. Yum! And the ‘Don Zombie’ burger has a parmesan-crusted pan-fried eggplant stack with melted provolone cheese, fresh basil, ZB roasted capsicum salsa and crisp iceberg lettuce on a toasted brioche bun. Double yum! I hear the Boomstick burger is a favourite. If zombies are coming to make delicious burgers then bring on the zombie apocalypse! There are hopscotch squares drawn in chalk outside on the footpath of the entrance of the shop. As you hop your way into Tuck Shop Take Away you are transported to a world of childhood nostalgia. 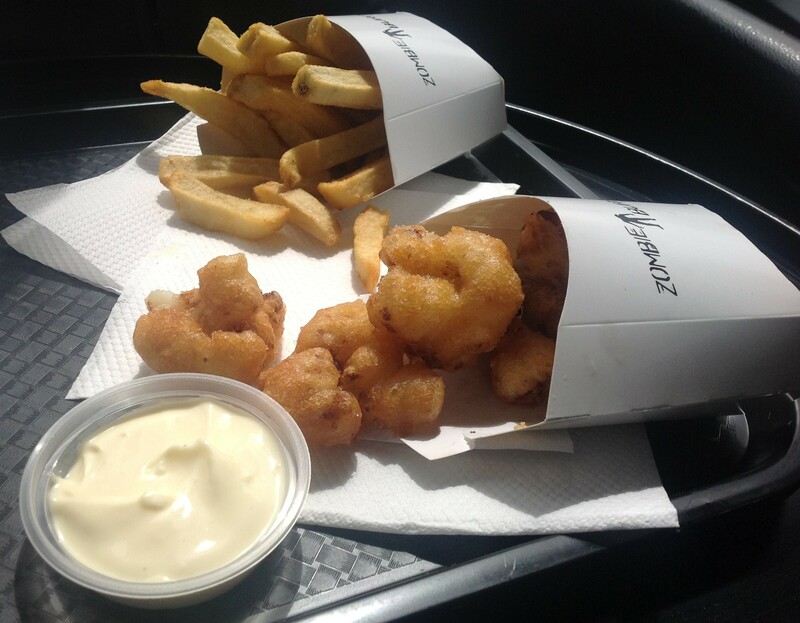 The memories of school days flood back as you order your tuck shop meal. New friends, young love and exploration come to mind. Rebellion, broken hearts and bad acne do too but we’ll leave those memories in the past where they belong. 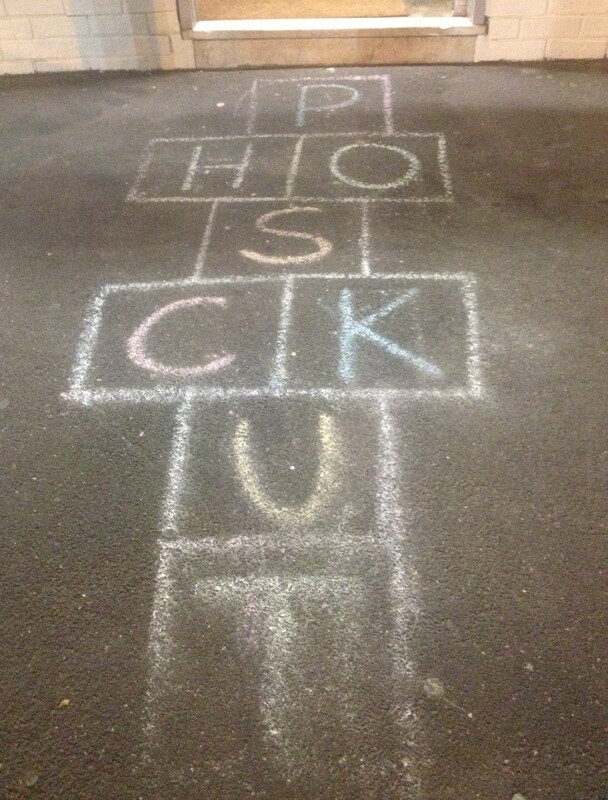 Tuckshop Hopscotch (Try to say this 5 times in a row – total tongue twister). The shop was created by Clinton and Katrina, husband-wife duo who have worked with culinary superhero’s like Heston Blumenthal (The Fat Duck), Ben Shewry (Attica) and Shannon Bennett (Vue de Monde). I think the experience with these food stars have definitely rubbed off on the couple. Their menu is imaginative like Blumenthal, the ingredients used are fresh local produce like Shewry and the food produced is of the highest quality like Bennet. This oldskool college canteen makes you feel like a kid. As you get overly excited about the playful menu chalked on the blackboard behind the counter, you realise nothing has changed and you are still that kid at heart. Some of the menu options are burgers and hand cut fries (yum), nutella, peanut butter and redskin milkshakes (omg) and pulled pork with smoked cheddar bechamel jaffles (aahhhh!). (excuse me while I restrain myself). “I want to order everything!” said my brain. 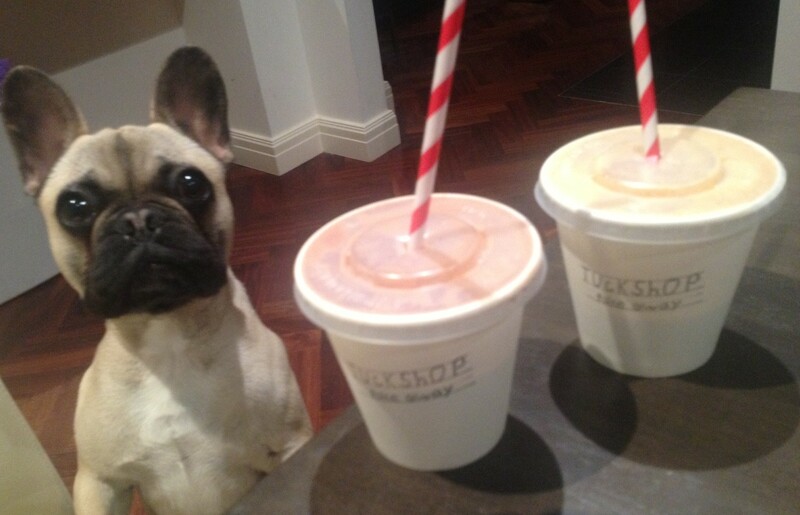 Marvellous Max and the Nutella and Salted Caramel Milkshakes. The burgers were yummy. The difference between the minor and the major is that the major has egg and bacon added. 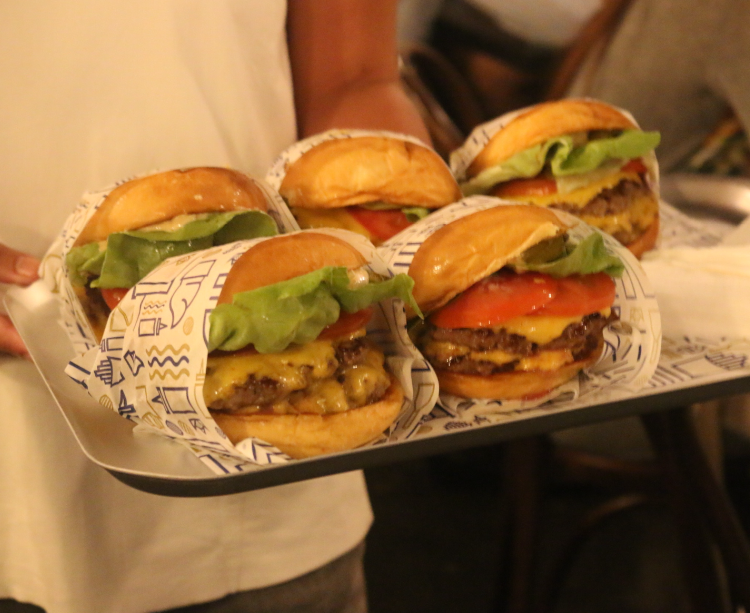 The buns are linseed dotted milk brioche (a little less sweet than your standard brioche), with a juicy beef pattie, iceburg lettuce, tomato, onion, pickles, cheddar cheese and ‘the tuck shop sauce’ which is a 3-hit combo of mayo, mustard and tomato sauce. Match that up with a house made soda or organic milkshake and I’m theirs to keep. For my vegie friends they have the ‘veggie wedgie’ with a lentil and rice burger. My mum said it was delish and as the saying goes ‘mothers are always right’. 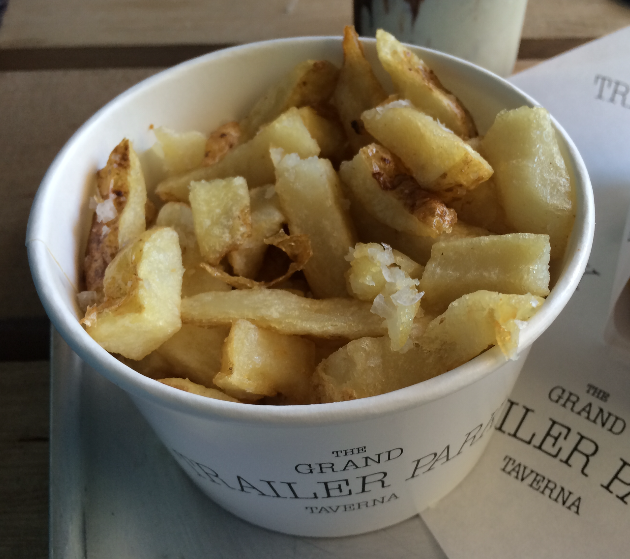 The hand-cut chips were yummy like my boyfriend in year 7 and oily like my skin in year 8. The ‘cuts’ are thinly carved hand-cut potatoes with the skins on. I like that they are thin chips with the skins on, because I’ve only ever had thick hand-cut fries with the skins on before. 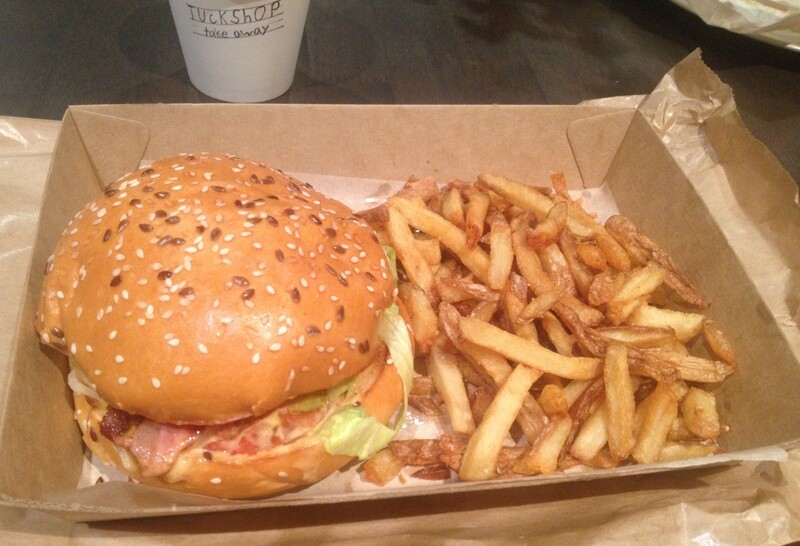 Tuck Shop Take Away – Major burger & cuts. The banana liquid cheesecake and salted caramel jaffle speaks for itself (delicious, delicious and deliciousness in a jaffle). Yum! I want to eat this for breakfast everyday for the rest of my life. My personal trainer said something about having a banana and toast for breakfast. (well this jaffle has banana and toast right?) We were cautioned that the jaffle was piping hot. After a few seconds of trying to wait for it to cool we had to eat it. The heavenly banana cheesecake salted caramel lava was absolutely amazing! Tuck Shop Take Away – Sweeeet. The choc chip cookies were yummy with big chunks of dark chocolate and crushed up kettle chips for a touch of salt. The crushed kettle chip bits had a crunchy chewy texture sort of like there were little bits of honey joys in the cookie. Loved it! I didn’t know other people liked redskins as much as me until this place opened. Redskins milkshakes, redskins tart, chocolate brownies with redskins ganache. It was great! The redskin tart was my favourite! It tasted exactly like redskins lollies but in a smooth and creamy tart form. Yummo! 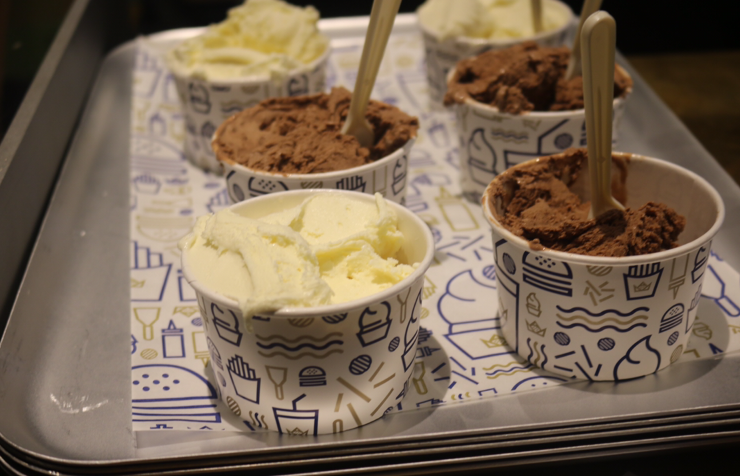 They also have unusual but delicious soft-serve flavours like chocolate pretzel, popcorn and salted caramel. 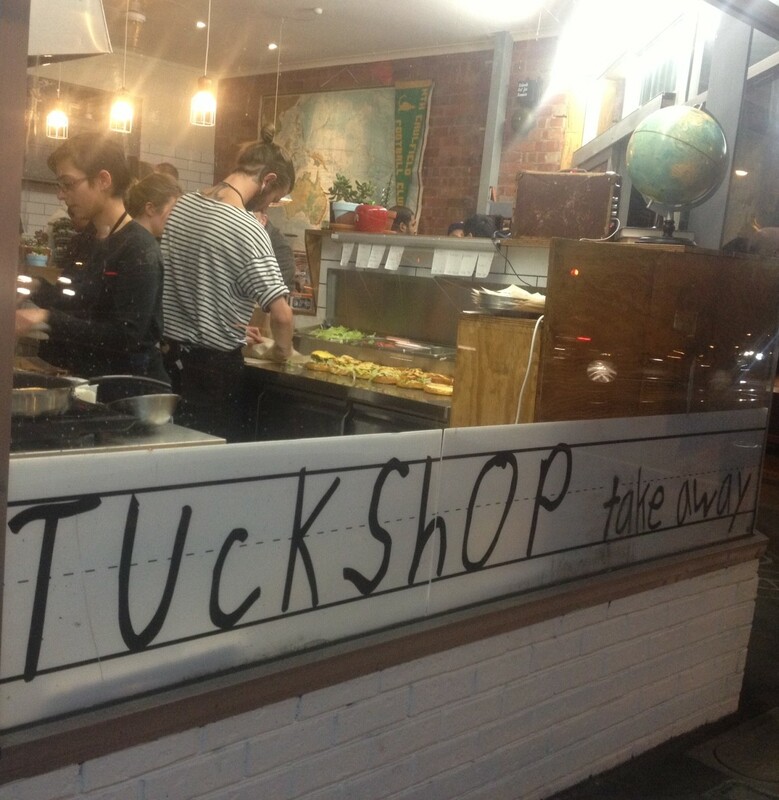 Next time I visit tuck shop takeaway I’ll put my sunflower stack hat on and ride my bicycle in. I’ll transport my burger & cuts home in the straw basket at the front of my bike with my peanut butter milkshake sitting in the side pocket of my backpack. This will add to the nostalgia. The store is itty bitty but you can picnic at Caulfield Park which is close by. 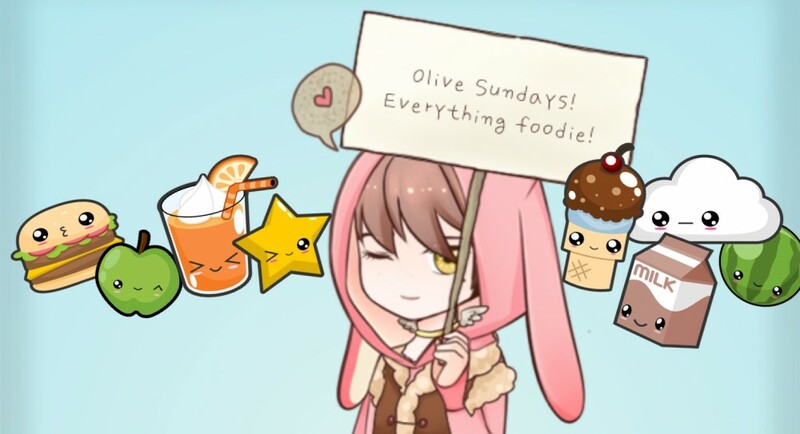 It’s a really fun place to grab a bite to eat and experience some deliciously creative food. 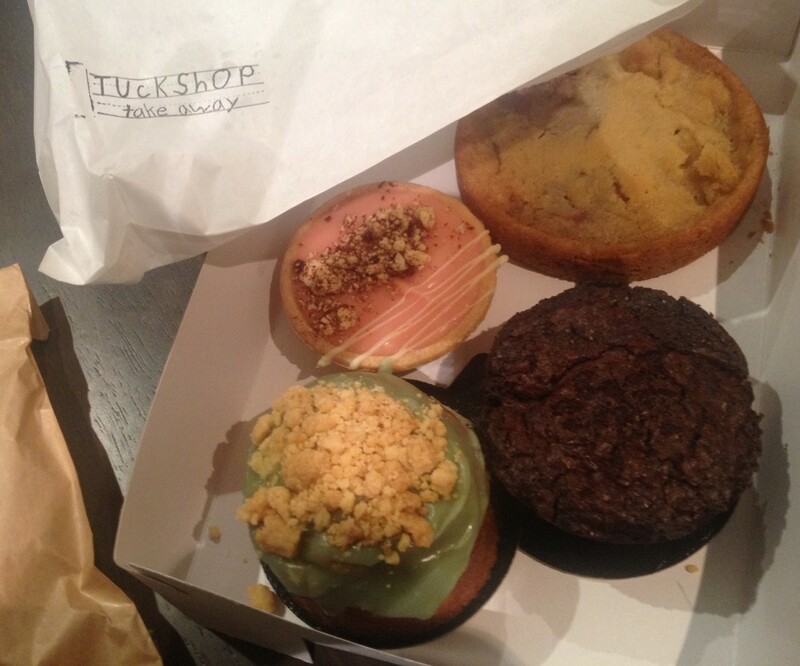 I heart Tuck Shop Take Away!